Your home is meant to be a safe harbor in a storm of pollution swirling around outside your door. However, the exact opposite may be true. It could be your home—the place where you relax, eat, and sleep—is actually full of harmful and dangerous forms of indoor air pollution. How can this happen? There are a surprising number of sources of indoor air pollution. Everything from biological contaminants to chemical compounds are potentially lurking in every room of your house. Let’s take a look at four of the most dangerous contaminants and how they are likely to adversely affect your health. Biological contaminants are substances like pollen or mold that can trigger physical symptoms when you come into contact with them. Pollen can follow you into the house or enter through open windows. Pollen can also infiltrate your house when you bring home fresh flowers or tropical plants. Mold, on the other hand, usually grows in damp places in your home like the basement or bathroom. Mold can also grow behind walls due to improperly installed moisture barriers. What are the health hazards of these two biological contaminants? Pollen can cause bouts of sneezing, stuffiness, and shortness of breath. These symptoms can make it difficult to sleep which may trigger fatigue as well. Molds can be toxic and can cause a barrage of symptoms too long to list. Everything from allergy symptoms, to fungal infections, to joint pain can be triggered. Cigarette smoke is number one on this list, but other sources of smoke can pollute the air inside your home. Burning incense can release chemicals into the air as can burning scented candles. Smoke can enter your home through windows when a neighbor uses his or her wood-burning fireplace. Even BBQs stationed close to windows or doors can be a source of indoor smoke pollution. Smoke has been linked to respiratory problems, damage to the light-sensitive cells of the eyes, and cancer. Products used to clean the bathroom and kitchen can be full of toxic chemicals. While much effort has been made to educate consumers about using “green” products, many still fall prey to advertising and continue to buy commercial brands. Tile cleaners, oven cleaners, window cleaners, and floor cleaners are some of the biggest culprits when it comes to adding harsh chemicals to your indoor space. These chemicals can irritate the eyes, lungs, and skin. They can also negatively affect your brain. Both carbon monoxide and radon could potentially be lurking in your house without you even knowing. These two gases are colorless and odorless. 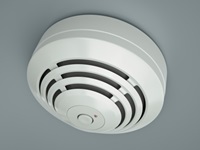 Carbon monoxide can be emitted from your gas stove or your furnace. Carbon monoxide can also get into your home if you live next to a busy road. This gas can be very dangerous and the best way to prevent exposure is to have a carbon monoxide detector that can warn you as soon as levels get too high. Radon gas, on the other hand, comes from the breakdown of uranium in rocks, soil, and water. Radon often shows up in basements or in well water—anything closer to the ground. Radon is thought to be responsible for many of the cases of lung cancer that occur in the U.S. every year. Test for radon in your home by buying a kit or hire a professional to get an accurate reading of radon in your house. “How Environmental Exposure May Affect Your Child,” WebMD web site; http://children.webmd.com/environmental-exposure-head2toe/default.htm, last accessed Aug. 30, 2013. “Indoor Air Pollution,” MedlinePlus web site; http://www.nlm.nih.gov/medlineplus/indoorairpollution.html, last accessed Aug. 30, 2013. “Radon: Health Risks,” The Environmental Protection Agency web site; http://www.epa.gov/radon/healthrisks.html, last accessed Sept. 2, 2013.